You may have heard a friend rave about how much they love their Instant Pot and how much time it saves them in the kitchen. Maybe you’ve scored one as a holiday gift after seeing it on that Black Friday sale. But how does this popular appliance work and what can it do? An Instant Pot is a kind of pressure cooker that uses steam to increase the boiling point of liquid in the pot, which speeds up the cooking process. 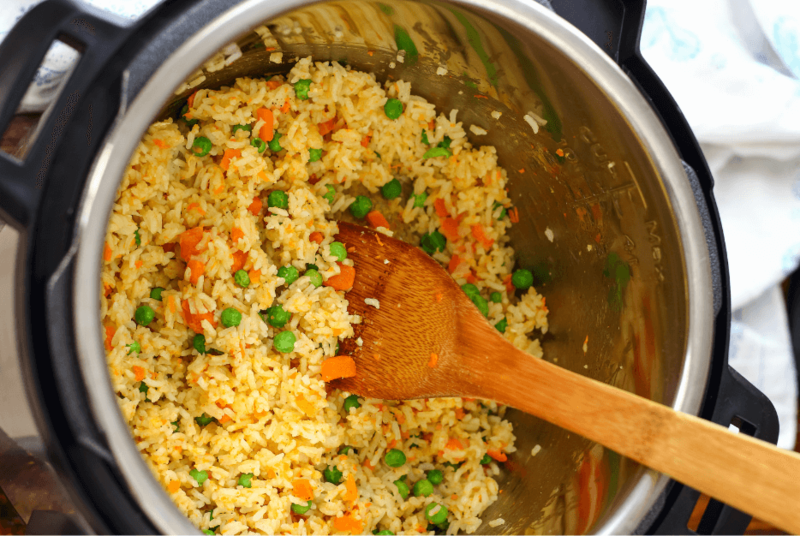 It works great for preparing meat and starchy vegetables, but it is versatile enough to also function as a slow cooker, steamer, and rice cooker. You can even use it to make yogurt and bake a cheesecake! The front of your instant pot will have a maze of buttons, but most are fairly intuitive. You’ll notice that the majority of these preset functions indicate a type of recipe (like soup, rice, or poultry) or a cooking method (like slow cook or steam). This means the pressure setting and cook time is built in, so you don’t have to worry about it (but if you’re curious, you can defer to your manual or this cheat sheet to get a behind-the-scenes look at what your Instant Pot is doing on each setting). You can also set the Instant Pot manually. Once you’ve loaded in your ingredients (which should include at least a cup of liquid, to prevent burning), close the lid, seal the valve, and choose a preset button. If you select “manual,” the instant pot will default to high pressure, but you can adjust this as you would the time. The screen will then read “ON,” which means the instant pot is building pressure. The cooking time begins once a number appears on the screen. You’ll also notice a silver valve rise next to the steam valve, which indicates the machine is fully pressurized. Once the time has finished, the machine will automatically switch to the “keep warm” function. Hot steam can be dangerous, so always depressurize your Instant Pot before you open the lid. There aretwo ways to do this: natural release and quick release. Natural pressure release begins automatically once the Instant Pot switches to the “keep warm” function, but you can also press cancel to trigger the process. This method can take between 10-30 minutes, depending on how much liquid was in the Instant Pot, and is best for recipes with a lot of liquid (like soup) or foods with a high starch content (like potatoes). To use the quick release function, turn the valve to open once food has finished cooking to release the steam faster. This method works best for foods that cook quickly (and may be in danger of overcooking! ), like fish or broccoli. Quick release takes 1-2 minutes. You can also use a combination of methods by letting the machine release pressure naturally for 10-15 minutes before you manually turn the valve to complete the process. More good news: Clean-up for Instant Pot cooking is fairly easy. Wash the insert and wipe down the exterior and you’re good to go. You will occasionally want to remove the silicone sealing ring to clean it thoroughly as well, because any build-up on this ring can prevent the pot from sealing properly. While the base interior pot has many functions, there are a few other tools you can use in your Instant Pot to do even more! One is the steaming rack or basket , which allows you to keep food out of the water in the bottom of the pot to gently steam them. Another is a springform cake pan , which can be used to make pressurized cheesecake. You can also purchase a glass lid so you can peek inside your Instant Pot when using it on a non-pressurized setting, as you would when sauteing. You can also buy a second inner pot in non-stick ceramic and replacement sealing rings. To use as a slow cooker, simply add all of your ingredients to the pot and leave the valve in an open venting position. Press the slow cook button, then enter the desired cooking time using the plus or minus buttons and the temperature using the adjust button. To use as a saute pan, fill the pot with ingredients but do not replace the lid--the pot won’t work on this setting if the regular lid is on (that’s where the glass lid comes in handy!). Then simply choose the temperature and cook until done. The pot has a default setting of 30 minutes for the saute function, but you can press cancel at any time. You can now find Instant Pot recipes on PlateJoy, but if you’re looking to adapt some of your old favorites, check out our guide for how to adapt recipes for an Instant Pot!